At the end of the 2012-13 campaign, the dynasty that brought the Lakehead Thunderwolves to CIS men's basketball prominency said goodbye. The majority of the roster that brought Lakehead to its highest of highs were graduating. With the core gone and a transition year ahead, Lakehead head coach Scott Morrison took a professional sabbatical to work with the Maine Red Claws, an NBA D-League franchise solely affiliated with the Boston Celtics. 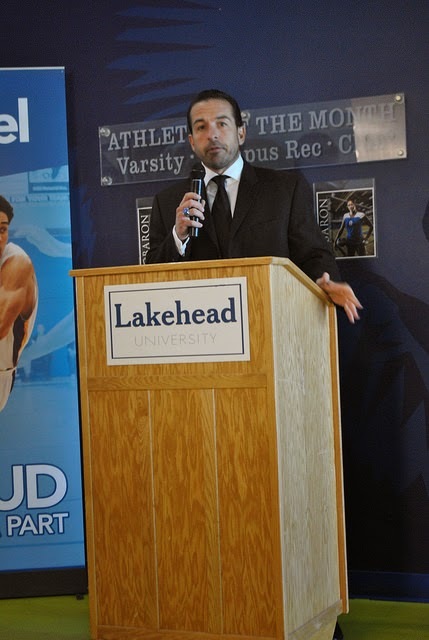 He joined the Lakehead athletic department in 2003. After a year with the D-League team, Morrison has been hired to be the head coach, replacing Mike Taylor. Maine issued a release on July 16 saying that Taylor "will not be returning for the 2014-15 season." Lakehead gave the formal announcement on August 15 that Morrison would be leaving the program after 11 years at the helm (ten years if you do not count 2013-14.) They also announced that Manny Furtado -- an assistant coach with the Carleton Ravens -- would be taking over control of the program. What Furtado is taking over is unclear, though. Lakehead made four straight national championship tournament from 2010-2013 but they used the "great group of dudes" to get there, and building a roster of that calibre will not be easy. That is not to say Morrison's original recruitment of Kiraan Posey (Baltimore, Maryland) or Warren Thomas (Washington, D.C.) -- the two players who vaulted the Thunderwolves into national championship contention -- was easy. Read Allan Maki's piece hyperlinked and you will see that chance played a healthy role getting those two players. Furtado is inheriting some young and intriguing pieces like Henry Tan (year two of eligibility in 2014-15) and Alexandre Robichaud (year three), as well as the 2012-13 CIS Rookie of the Year, D.J. Smith. He has to sit out 2014-15 per standard transfer rules after two seasons with the University of Prince Edward Island. Tan and Robichaud's ceilings are unknown, but it is fair to say that neither seem to be players that you will build your program around. So, Furtado has assets, but they are not likely to bring the team back to its previous heights. Which begs the question: how big of a loss is Morrison for Lakehead? I will readily admit that my knowledge of CIS men's basketball as a whole is limited in comparison to my understanding of the OUA men's hoops scene. But outside of Carleton's Dave Smart, is there a coach that is more integral to a program than Morrison? You have to imagine that part of the reason players are signing up to live in Thunder Bay, Ontario for five years is the well-regarded coach offering them the opportunity. Furtado has the Carleton legacy with him now, and being one of the first branches on the Dave Smart coaching tree is an absolute positive. How he leverages in recruitment pursuits would be interesting to watch, although it is not likely we will ever get a glimpse in to that. Regardless of who the Thunderwolves athletic department chose to take over from Morrison, Lakehead would be in line for a regression. Dwayne Harvey is in his fifth-year and was one of the only players with a PER above 15 - the average rating. More importantly, Harvey is the offensive facilitator for the team by assist rate metrics and one of the better ones in the country by that statistic. There are more reasons for regression, including a lack of front-court depth, but words are at a premium. Given what we know at this time, Furtado is as good a selection as anyone. But he will need to quickly establish himself as a premiere coach in the league in order to maintain a semblance of what Lakehead expects of their men's basketball team. Its no simple feat to replicate four national championships in four years, but it may be more difficult to fill the shoes of Scott Morrison. Lakehead just shot up my ranks for 2014-15 teams to watch. I'd be an idiot not to address the change of by-line and editorial oversight, especially in my first post in this position. The CIS Blog has seen a dwindling amount of content over the past few years as writers aged out of the university beat, but that does not mean this place has to die with their departure. As I hinted earlier in the post, my knowledge of the CIS as a whole is not what I would like it to be, but it is still strong. This blog deserves a ton of credit for that. If you're interested in writing for us, Shelby and I are interested too. Send me an email - scott1hastie@gmail.com - and we can set something up.